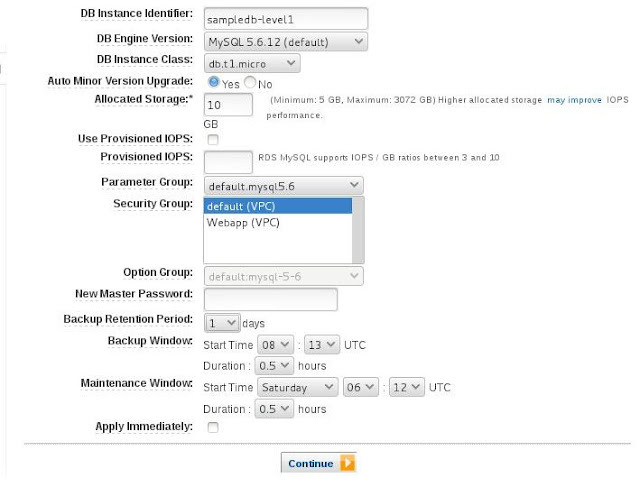 Amazon RDS MySQL version 5.6.12 on AWS WEST region was used. To create RDS MySQL Read replica navigate to the dashboard of Amazon RDS, select the Amazon RDS MySQL Master(named "sampledb") and use the option of “Create Read Replica”. Name the newly created Amazon RDS Read replica as "sampledb-level1" and place it in Tier 1. The Tier 1 Amazon RDS MySQL read Replica can be created in same AZ of Master or in a different AZ for High Availability. When the Tier replica is placed in Different AZ , you should factor few extra milliseconds of latency during replication. To create Second Tier Read replica navigate to the dashboard of Amazon RDS, select the Amazon RDS Tier 1 Read Replica (sampledb-leve1) as the source and use the option of “Create Read Replica”. Name the newly created Amazon RDS Read replica as "sampledb-level2" and place it in Second Tier 2. 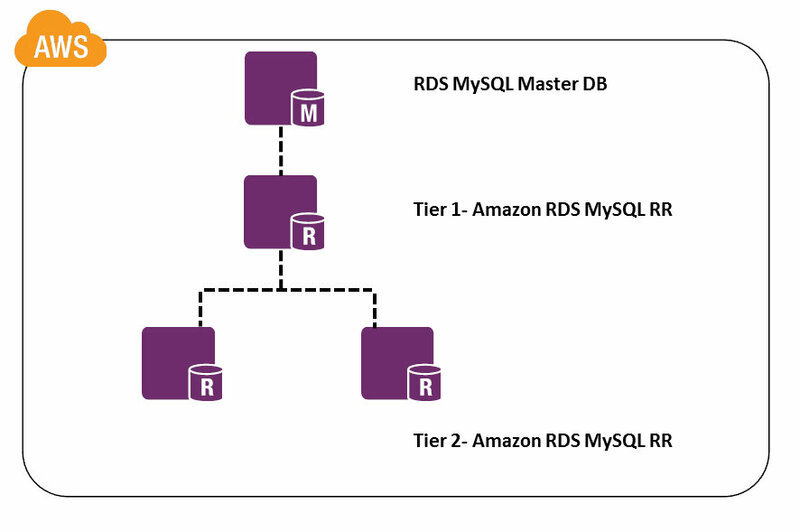 The Second Tier -2 Amazon RDS MySQL read Replica can be created in same AZ of Tier 1/Master or in a different AZ for High Availability. One of the main complexity behind Multi-Level replication is that, if Tier 1 Read Replica if not properly architected/placed, it can be a single point of failure. Imagine a case where you need 4 Read Replicas for your Master DB. You can take following approaches as illustrated below while designing your infrastructure for this requirement. In Architecture-1, Tier-1 Read replica is a Single Point of Failure. Instead if you split Tier-1 itself into two separate fleets it offers better availability than architecture-1. Since both Tier-1 RR put replication load on Master DB , you can by pass this using Hot Standby instance. Benefits of this approach is explained below in the best practice architecture. 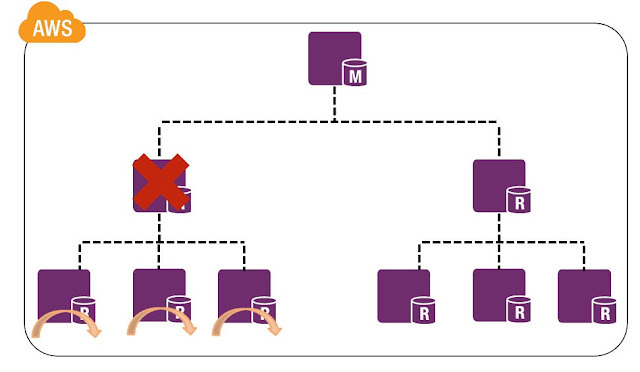 Condition 2- Tier-1 Read Replica Failure : Entire Tier-1 and Associated Tier-2 has to be recreated. The Alternate Active Fleet of Tier-1+Tier-2 will serve the requests for high availability. Condition 4- AZ NW problem: In event AZ-3 is failed, Requests are served by alternate fleet of Tier-1+Tier-2 in another AZ(AZ-4). It is recommended to create Tier 1 Read Replicas from Multi-AZ DB instance to offload read queries from the source master DB instance for high traffic sites. If the source instance of a Multi-AZ deployment fails over to the secondary, any associated read replicas will be switched to use the secondary as their replication source automatically. This model guarantees high availability. P1) Circular replication are not allowed in this tiered replica creation process. P3) When the "X" Tier replica is placed in Different AZ , you should factor few extra milliseconds of latency during replication. P5) We have used t1.micro as RDS DB for article explanatory purpose. For production use cases please use proper instance types after proper capacity planning. P6) AWS has released Parallel replica creation process, where you can create multiple Tier 1 and Tier 2 replicas in parallel. Since you no longer need to wait for one replica creation before starting the next one, it becomes easy to create multiple RR quickly. Without this feature, it would take hours to create a large Multi-tiered Replica setup. 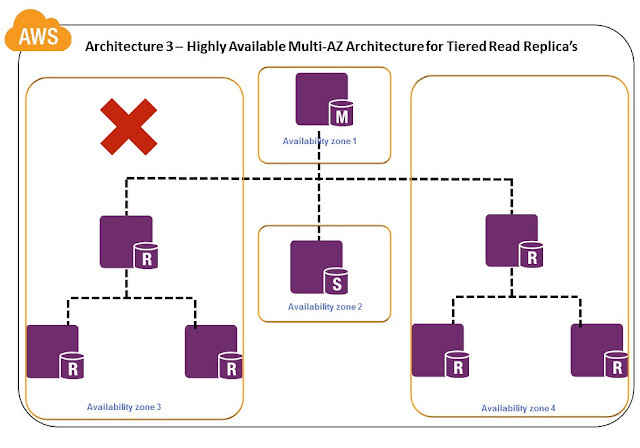 P8)Why it is better to have Multi-tiered Read Replica as the last resort in your architecture ? 8.a)Currently 30 Read Replica can be created overall for a master in two tiers. 30 Read replica is more than sufficient and usually turns out to be costly architecture approach. Use this approach only for cases, which demand heavy read and when application code cannot accommodate changes and are highly DB dependent. 8.b)It is recommended in DB world to stay away from Multi-level replication as much possible. Your architecture will be much simpler with one master and "X" replica slaves, rather than having tiered replica's. 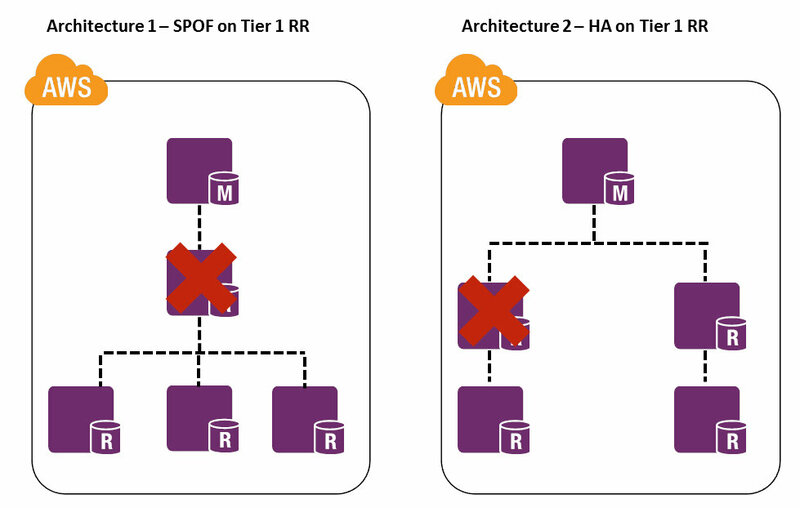 As we observed in above deployment architectures, the second tier replica slave will be a trouble to manage in event of replication delay, crashes and network problems affecting the Tier-1 RR or the Master DB. Re-balance the DB load by using alternate data stores provided by AWS like DynamoDB, ElastiCache, CloudSearch etc. If the above methods does not work for you, take the Second tier Read replica approach. Thanks Senthil and Ram of 8KMiles for taking part in this analysis.